In Europe, a majority of boilers have modulating thermostats that regulate the boiler flow temperature dependent on the room sensor. In the UK most boilers have ON/OFF style room thermostats. At MyBoiler Ltd modern efficient ‘A Rated’ boilers are installed with these modulating thermostats as a high standard. Modulating room sensors as they are known, can increase the efficiency of the boiler much better than ON/OFF style room thermostats. A good analogy would be that standard room thermostats tell the boiler to simply come ON and OFF versus a room sensor (modulating thermostat) that tells the boiler exactly the temperature it is currently at and also the temperature it needs to achieve. Also to note, whilst new ‘A Rated’ boilers are able to try and predict demand (also known as internal modulation), these are no way as accurate as a room sensor (modulating thermostat) combined with compatible boiler . OpenTherm is one such popular standard that enables this more intelligent way of controlling a boiler. 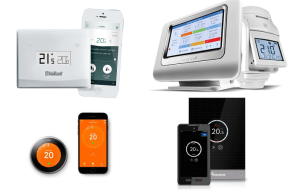 Boiler manufacturers commonly now have their own modulating thermostats that are also available as Smart Thermostats. 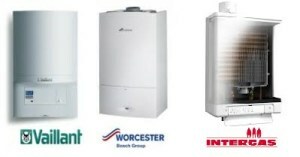 Vaillant has vSmart, Worcester Bosch has Wave, etc. There are also exist independent Smart Control manufacturers such as Nest* and Honeywell Evohome that produce OpenTherm compatible modulating controls. *Nest 3rd Generation. If your boiler has an OpenTherm connection then you can connect an OpenTherm compatible control. Some boilers such as the Vaillant and Worcester have their own proprietory connections for which either you use their own controls or if they support OpenTherm modules than any OpenTherm control can be connected. An advantage of using manufacturers own controls is that sometimes more information and control of the boiler can be obtained. A disadvantage of using manufacturers own proprietary controls is that you could also be locking your self into that manufacturer. Or see What is OpenTherm?